Some maces and hammers may block most attacks. 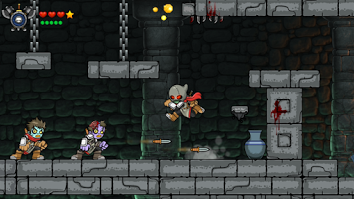 You can revisit previous levels anytime, looking for treasures you might have left behind. Combine armour and weapons with matching magical elements and gain damage bonus. You can get an extra jump boost by jumping again while still in the air. Use potions and avoid dying in vain. Pay with the gold to revive without losing items collected in the current level. The fire element armor protects you against flames. The air element armor protects you against spikes. Replay previous levels without taking any damage to gain extra completion % points.